AvaSoft-CHEM has been developed to enable on-line concentration determination with a spectrometer system. According to Lambert-Beer's law, there is a linear relationship between absorbance and concentration. Where A is the absorbance (or extinction), e is the extinction coefficient of the compound to be measured, c is the concentration and l is the optical path length. In practice, this relationship is only linear at reasonably low absorbance levels (say less than 2). The wavelength at which the absorbance is measured must of course be kept constant.If a few samples with known concentration are available, these can be used to measure the absorbance. 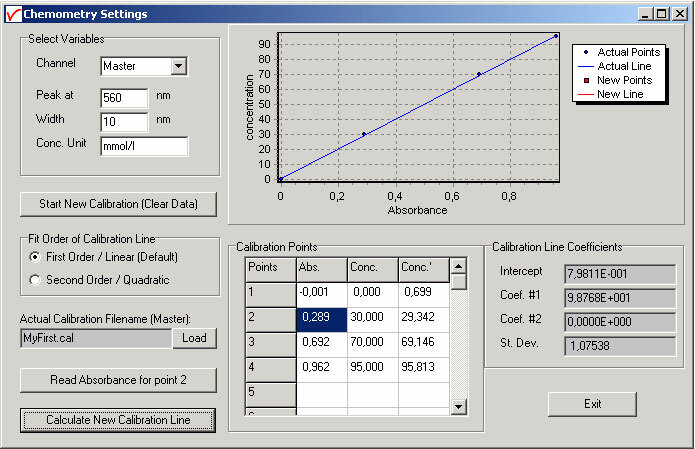 These absorbance values can be used in AvaSoft-CHEM to calculate a linear (or second order) calibration line. Then, this calibration line is used to measure the concentration of unknown samples or to measure a changing concentration against time . * The concentration can be displayed on-line in a separate display window, for up to eight spectrometer channels (if available). * Up to eight history channels functions can be selected to display and save concentration values against time. This application can be combined with the Excel and Process-Control applications.